KAMLOOPS, B.C. 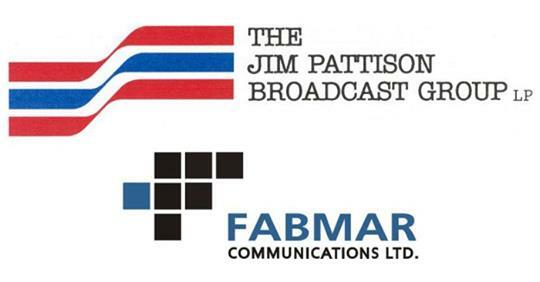 – The Jim Pattison Broadcast Group Limited Partnership (Pattison) and Fabmar Investments Ltd. (Fabmar) today jointly announced Pattison’s acquisition of Fabmar Communications Ltd. and it’s four radio station licences (and related assets) located in the provinces of British Columbia, Alberta and Saskatchewan, subject to CRTC approval. About Jim Pattison Broadcast Group The Jim Pattison Broadcast Group, with its head office in Kamloops, B.C. is the country’s largest private, western-based broadcast group, currently operating 41 FM, 2 AM radio stations, three conventional television stations and 14 online news portals in 25 different markets, in British Columbia, Alberta, Saskatchewan and Manitoba. The Jim Pattison Broadcast Group is a proud division of the Jim Pattison Group, a diversified group of operating businesses, based in Vancouver, which has grown to become the second largest privately-held company in Canada. Please visit www.jimpattison.com and www.jpbg.com for more information. As the last News Director of the Drive before the newsroom was shut down in 2014..I’m just “sitting here watching the wheels go round” and curious like everyone else, where this thing will land. NOTE to the Pattison group. Imagine the buzz that you could create if you bought CKNW and ran it like the Grifiths people did once upon a time. It would make many boomers very happy and might even keep some out of one of your generously donated hospitals. Just a thought?